The organizers of this year's FIGMENT festival were hoping for clear skies this past weekend, but there was one cloud they welcomed with open arms. 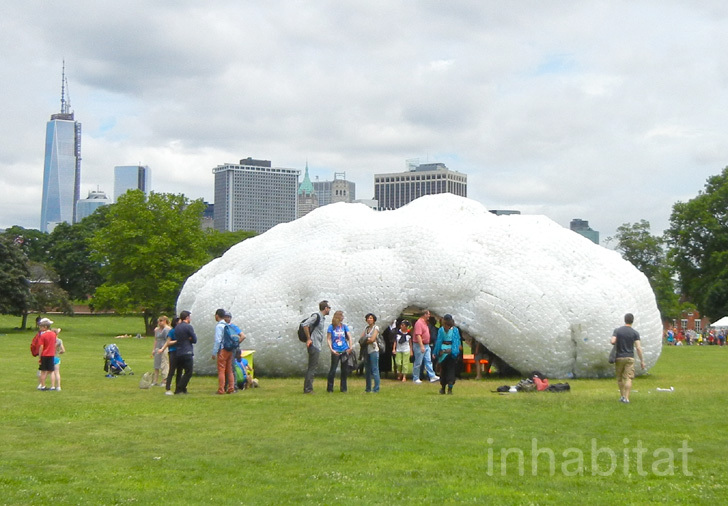 After months of hard work, STUDIOKCA's “Head in the Clouds” pavilion made of 53,780 reclaimed plastic water bottles finally popped up on Governors Island for the participatory art fair, and invited festival-goers to enter the pillowy structure to experience it from within. Click through our gallery to take your own tour through this dreamy, eco-art installation. 300 volunteers from the Emerging NY Architects Committee, the Structural Engineers Association of NY, and the FIGMENT arts organization joined hands with STUDIOKCA’s Jason Klimoski and Lesley Chang to construct the recycled pavilion, which was the winner of this year’s “City of Dreams” design competition. STUDIOKCA sourced the thousands of bottles that make up the installation from all over the city from both individuals and businesses. While Head in the Clouds was designed to be a light-hearted, fun experience for visitors to the island, it also calls attention to the nearly 48 million plastic bottles thrown away every day in the US. In fact, STUDIOKCA took great care to size the pavilion to represent the number of plastic bottles thrown away in New York City in just one hour – about 53,000 bottles. Kind of makes you think, doesn’t it? Head in the Clouds was built upon a 40 ft long x 18 ft wide x 15 ft high frame of curved aluminum tubes fitted together with clamps that was then covered with “pillows” made of 1 gallon water jugs woven with netting. The inner ceiling of the pavilion was lined with smaller plastic water bottles filled with blue water dyed with organic food coloring to glint and glitter in the sun. At first, we weren’t quite sure if STUDIOKCA would be able to achieve the effect they wanted to with this method (the idea was to create a dream-like atmosphere inside the cloud), but we’re believers now after viewing the final execution for ourselves. Don’t forget to click through our gallery to find your own head in the clouds for just a little while. 300 volunteers from the Emerging NY Architects Committee, the Structural Engineers Association of NY, and the FIGMENT arts organization joined hands with STUDIOKCA's Jason Klimoski and Lesley Chang to construct the recycled pavilion, which was the winner of this year's “City of Dreams” design competition. STUDIOKCA sourced the thousands of bottles that make up the installation from all over the city from both individuals and businesses. While Head in the Clouds was designed to be a light-hearted, fun experience for visitors to the island, it also calls attention to the nearly 48 million plastic bottles thrown away every day in the US. In fact, STUDIOKCA took great care to size the pavilion to represent the number of plastic bottles thrown away in New York City in just one hour - about 53,000 bottles. Head in the Clouds was built upon a 40 ft long x 18 ft wide x 15 ft high frame of curved aluminum tubes fitted together with clamps that was then covered with "pillows" made of 1 gallon water jugs woven with netting. The inner ceiling of the pavilion was lined with smaller plastic water bottles filled with blue water dyed with organic food coloring to glint and glitter in the sun. Festival-goers taking a load off inside the "cloud". At first, we weren't quite sure if STUDIOKCA would be able to achieve the effect they wanted to with this method (the idea was to create a dream-like atmosphere inside the cloud), but we're believers now after viewing the final execution for ourselves. There was a DJ booth and live entertainment inside the cloud as well. Kudos to STUDIOKCA and FIGMENT on this year's successfully executed "City of Dreams" pavilion.